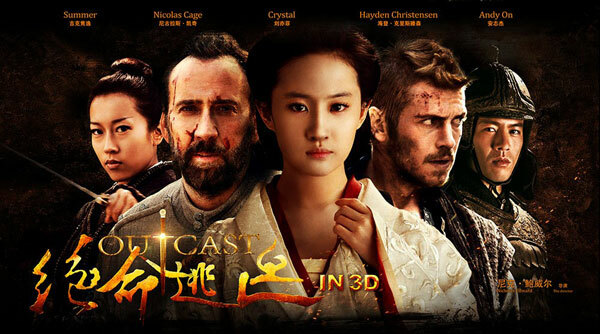 "Outcast" the Chinese-produced historical actioner starring Nicolas Cage and Hayden Christiansen is getting a second-coming with a near-simultaneous release in the U.S. and China after the film's mainland opening was cancelled in September. The film, which is mainly in English, follows two medieval soldiers that flee the battlefields of the Crusades and head east, where they find themselves embroiled in a power struggle in ancient China. "Outcast" rides onto mainland screens in January of next year, then hits North America in February. The film was originally meant to open in China on September 26, but was withdrawn hours before release by Yunnan Film Group with no explanation. The Chinese side later cited anti-piracy as the reason. Actor Hayden Christiansen was in China to promote the film's launch at the time of the cancellation. The January release of "Outcast" falls between China's two biggest box office peaks—December and Chinese New Year, which begins on February 19 next year.